2fm's Keith Walsh and Diarmuid Byrne. 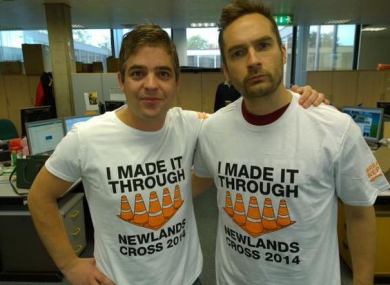 They made it through Newlands Cross, apparently. COMMUTERS AND COMMERCIAL drivers who regularly use Newlands Cross in Dublin will be breathing a sigh of relief this afternoon, following confirmation of the new fly-over’s opening by the National Roads Authority. Major roadworks have been taking place at the busy N7 junction since January of this year — and in the intervening months, motorists have had to put up with the usual sort of frustrations that go along with an infrastructure project of such a scale: regular lane layout changes, temporary traffic-lights, long tail-backs, etc. etc. That all changes from next Thursday however. If all goes well with the installation of a motorway gantry sign on the flyover this coming Monday the contractor (BAM) will allow traffic on the road Thursday morning next. As well as cutting journey times for N7 users, the project’s completion will also ease local traffic on the Belgard and Fonthill roads. The flyover also means it will now be possible to drive from the border to Dunkettle in Cork without having to stop at a lights-controlled junctions (mind-you, you’ll still have to stop at tolling booths). Some 90,000 vehicles a day use the N7, which is the country’s second-busiest road after the M50. Email “Drive through Newlands Cross? We've some good news for you ”. Feedback on “Drive through Newlands Cross? We've some good news for you ”.